Today as I was debating what to cook for dinner, Savvy Babe wanted to play cooking in his playroom. Instead of cooking real food, I spend time cooking and baking with him on his new kitchen set. 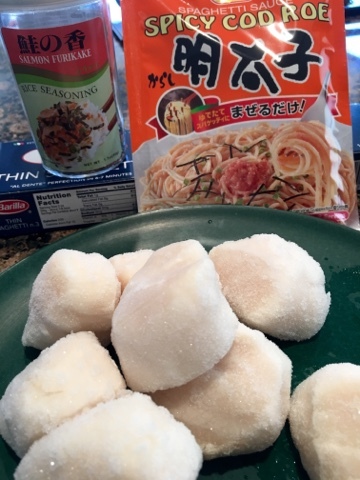 In a hurry, I grabbed a handful of jumbo wild scallops out of the freezer to thaw and looked in the pantry for dinner idea. Even though hub offered for us to eat out or bring food home, I still prefer a simple home cook meal. This Japanese style spaghetti with seafood is a particular favorite in our family. In this instance, I used jumbo wild scallops but shrimps or king crab would work equally as well. Ingredients are all shown in the photo below. I got the spicy roe sauce from a Japanese market but Asian markets like 99 Ranch would also carry it. There is also none spicy version. I like to use thin spaghetti but regular spaghetti works perfect well. 2. While pasta is cooking, sear scallop on the super hot pan that is coated lightly with oil. Make sure scallops are dried with paper towel first. Once brown on both side, remove from pan. 3. 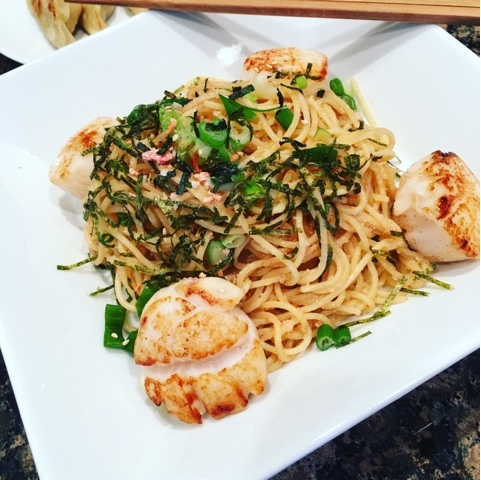 Remove pasta from broiling pan and place directly into the pan that is used for searing scallops. All the leftover browning on the bottom of pan adds flavor. Use a little pasta water if too dry. 4. Add spicy cod roe sauce to pasta and mix well. 5. I usually like to add a little green onion to add another layer of flavor and a dash of olive oil to finish off the pasta. 6. Plate and sprinkle rest of green onion on top along with the seaweed from the sauce package. Add scallops and enjoy! This is a dish that hub and friends always ask for all the time. It's easy to prepare and hearty but also very luxurious. I usually like a glass of chilled white wine to go with the pasta. Bon appetite!